Currently running in London, Positive Futures recruits youth leaders aged 18 to 25 to design and deliver their own exciting new social action projects to address the most pressing issues in their local communities. Young people across Ipswich will now have the opportunity to take part in the scheme, helping to develop their employability skills, gain life experience and improve their inter-personal skills. Highlights from the London project to date include an intergenerational film club, fundraising events for local homeless people and a spoken word event in a local library encouraging other young people to make use of the facility. Former Police Sergeant and Ipswich Town FC Academy Coach, Darren Oxbrow from Ipswich will join Volunteering Matters to drive the youth social action project across the county. As part of his role, Darren will also support development of the acclaimed WASSUP project. Since 2012, WASSUP has been supporting young women at risk of abuse by campaigning, raising awareness and sign posting to safety. 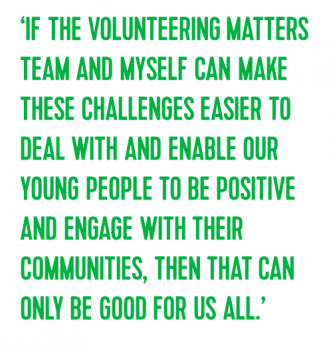 Thanks to funding from Police and Crime Commissioner’s Safer Suffolk Fund, Volunteering Matters will be able to offer an individual bespoke package of support which will give many more young people, including young male victims, the courage and confidence to report crime, and develop resilience. Darren joins Volunteering Matters after over 20 years in the police force where he has worked on a number of initiatives for young people.